There's no better time of year than Christmas, especially in South Park. So, stop fighting with the family, gather 'round the fire and watch these classic South Park episodes. Join in as the citizens of South Park sing many of everyone's favorite holiday classics like, "Mr Hankey, the Christmas Poo" and "Christmas Time in Hell". See the boys bring Christmas to Iraq and learn how hard it is to be a Jew during this holiday season. Christmas is a time when we all can put aside our differences and agree on what the holidays are really about: presents! Back before Comedy Central started to release full season sets of South Park, they put out two holiday-themed compilation DVDs: 2000’s Christmas in South Park and 2001’s Winter Wonderland. Since it’s been six years since that last one – and since the full season sets are up to date and they need more product – I guess the time seemed ripe for a new one. 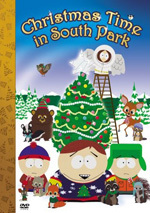 That’s why we now have Christmas Time in South Park, a complete package of all seven of the series’ Yuletide episodes. I’ll look at these in the order originally broadcast. As usual, the synopses come from the DVD packaging – the prior DVDs, that is, because I see no reason to use the new disc’s shorter recaps. “Poo” introduces two semi-major Park characters. We get the titular piece of crap as well as the school’s counselor, Mr. Mackey. The show tosses some good jabs at attempts to secularize Christmas, and Mr. Hankey provides one of the most oddly endearing characters in a while. In addition, it’s hard to beat Cartman’s song about Kyle’s mother. “Poo” provides a solid episode. I figured that "Manson" would mistake offensiveness for irreverence and humor, but I was completely wrong. This show is one of the season’s best and offers a hilarious visit to Cartman's grandmother's house. If nothing else, the scenes with Cartman's relatives - especially baby cousin Elvin - are terrific and the show manages to avoid any gratuitously crude elements. It should seem lame, but it instead comes across as very amusing. This show didn't attempt a plot and instead cobbled together a bunch of holiday songs. Although it has a few good moments, I thought this episode was generally weak. Mr. Hankey was always a questionable character anyway - after all, he is a singing and dancing piece of poop - and this show included too many unnecessarily offensive elements. I mean, is there any point to depicting JFK and son, Princess Diana, and Gene Siskel as residents of hell? None I can discern, other than to upset some folks. “Crappy” is one of the better episodes, if just because it found some very witty ways to spoof various subjects. When Mr. Hankey confronts his son’s concerns, he does so through a musical number baldly based on The Lion King’s “Circle of Life”. As seen during the Bigger, Longer and Uncut theatrical movie, the South Park crew absolutely excel at musical parodies, and this one is no exception; they nail the project. In addition, another spoof takes on a more obscure subject. I don’t know if it still airs widely, but I strongly recall a Rankin-Bass animated special from the Seventies called ’Twas the Night Before Christmas that featured George Gobel as Father Mouse. His brainy and nerdy son Albert ruined the holiday because he sent a letter to Santa that essentially told St. Nick to go elf himself. When Albert learns that his intentions were way off base, he fixes a special clock intended to alert Santa that the town really loves him despite the contents of the letter. Clearly the movie theater aspect of “Crappy” takes from this concept, and the show also includes a nice little parody of a ’Twas tune called “Even a Miracle Needs a Hand”. The Lion King spoof was fun because it came in an unexpected place; the movie may be awfully famous, but one doesn’t anticipate a connection to it in a Christmas show. Obviously, segments that mock a Yuletide program are more logical, but “Crappy” earns points through the use of a somewhat obscure inspiration. “Crappy” seems like very good South Park. Don’t expect much from this erratic show. The only real laughs come from Jimmy’s interminable rendition of “The 12 Days of Christmas”. The episode periodically revisits this and always gets laughs from it. The Santa parts are crude and unfunny, though. A show that focused solely on Cartman’s attempts to be nice would be more amusing than this choppy spoof of action films. It must be tough to come up with different ideas every year for a Christmas episode, and I give the series credit for the mix of concepts it uses. That said, how do you ever top a talking piece of poop? “Critter” acts as a decent parody of the usual animated holiday fable, but it doesn’t do enough beyond that to excel. The whole Satanic twist doesn’t stand out as especially clever, to be honest, and it undercuts an already tenuous show. I do like the ending, though. 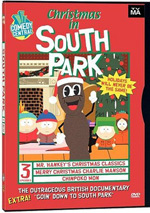 Christmas Time in South Park appears in an aspect ratio of 1.33:1 on this single-sided, double-layered DVD; due to those dimensions, the image has not been enhanced for 16X9 televisions. Because these episodes spanned from Season One through Season Eight, the picture quality varied quite a lot. Without question, the episodes from the first two seasons looked the weakest. They tended to be acceptably well-defined but never terrifically so, as they showed average sharpness. Jagged edges and shimmering came along for the ride, and colors were somewhat heavy and noisy. Blacks lacked depth, while low-light shots were a bit too dense. The first two shows were watchable but flawed. Matters improved for the rest of the package. Season Three’s “Mr. Hankey’s Christmas Classics” was still a little messy, but after that, we got solid “B+” level visuals. The shows looked pretty sharp and concise, and jaggies/shimmering decreased. Colors were brighter and bolder, while blacks and shadows showed better definition. Though the transfers were up and down, enough of them looked good for an overall “B” grade. As for the Dolby Surround 2.0 soundtracks, those seemed more consistent, though not perfectly so. 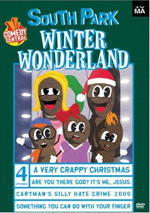 Again, the older episodes had some problems, especially “Christmas Poo”. The series’ earliest shows suffered from some noisiness, and that caused distractions here. Otherwise, the episodes tended to provide acceptable audio. They never boasted broad, involving soundfields, as the mixes tended to stay with general environment. Music showed decent stereo imaging, and the effects added a modest sense of place. Nothing stood out as very memorable, though. Audio quality was perfectly adequate. Speech occasionally showed a little edginess, but the lines usually seemed concise and natural. Music was pretty good, with the shows’ best bass response, and effects seemed fine. They demonstrated acceptable range and definition, though they never appeared particularly memorable. As always, the series didn’t present impressive audio, but the tracks worked fine. Unfortunately, Christmas Time in South Park provides no real extras. The DVD opens with previews for The Sarah Silverman Program, Drawn Together and Dr. Katz. That’s it – none of the commentaries from other discs reappear here. While the shows can be hit or miss, Christmas Time in South Park offers a nice collection of holiday episodes. It features all of the series’ Christmas shows to date, which makes it a good “all in one” package. The DVD presents inconsistent but usually positive picture and audio but lacks any extras. 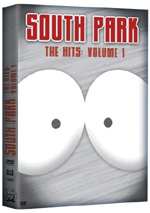 Fans who already own the season sets won’t have any use for this one, but if you want a sampler of South Park holiday shows, this DVD makes sense for you.